Cop in the Hood: "Because we are sworn to protect those that can't protect themselves"
"Because we are sworn to protect those that can't protect themselves"
For the second time this week, the law enforcement community suffered a great loss. 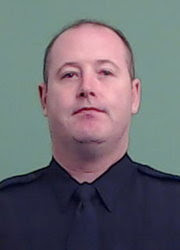 NYPD Sgt. Paul Tuozzolo was shot in the head while attempting to arrest a very bad man. That bad man had 17 prior arrests and had just committed a home invasion in the Bronx at the home of his estranged wife. That bad man had a gun, a gun he used to take Paul's life and attempted to take many others. Luckily a rookie officer, who was still in police academy field training, was able to put an end to that bad man's rampage. But not before that bad man destroyed Paul's family, leaving his wife a widow and his two children fatherless. I didn't know Paul. We were both veterans of the 26th Precinct, but Paul was promoted just a few months before I was transferred from East Harlem to West Harlem. However, I see on my Facebook feed from my 26 family who worked with and were friends with Paul, that he was a great man, father, husband, and police officer. He had 19 years of service. 19 years of putting on that uniform every day to make New York City a better place. 19 years of working midnights, holidays, weekends and being away from his family. 19 years of selfless service. And even if I didn't know Paul, I knew Paul. Paul was just like every one of us who puts on the uniform every day not knowing what to expect, but knowing we do what we do because we make a difference. Because we are sworn to protect those that can't protect themselves. Because we have given so much and far too many of us, have given our all, in order to make the world even a little better place. Every time a cop gets killed, I change my profile picture to a badge with a mourning band on it, and I write a post. I do this not so much for myself or the other cops on my friends list, but rather, so that my friends from my other diverse groups can understand that we are human, we feel pain, and all we want is to do our job, make a difference, and go home to our families. And all of us are willing to pay the ultimate sacrifice to make this world better. But, I have come to realize that the Michael Marks, a Marine Corps veteran quote, "And maybe just remind the few, if ill of us they speak,that we are all that stands between The Monsters And The Weak" isn't something we have to do. Because for anyone that has ever worn a uniform to work, not knowing what that day of work will bring (our Armed Forces, police, fire and EMS and others), it doesn't really matter if people understand the evil we protect them from. What matters is that we can look at ourselves in the mirror every day, honor our lost brothers and sisters, and continue on, in their memory, in making this world a better place. Sgt. Paul Tuozzolo, Blessed is the True Judge. May your family, friends, the NYPD and the entire City of New York find comfort during these trying times. We will carry on your watch from here. Fidelis ad mortem. Faithful unto death. Rest in peace, Sgt. Tuozzolo. Rest in peace. a certain David Koz claims that Trump phoned Sgt. Tuozzolo's widow, to apologize for not being able to attend her hub's funeral. I've found no separate verification of this story. Any thoughts? "Biggest Spike in 50 Years"
"I took an oath to protect all"